Join, Locally. If refugees have resettled in your community, you may discover that an informal group of advocates meets regularly to discuss human rights issues in Burma—or you can start one. Networking with like-minded individuals will accelerate your learning curve, inspire collaborative efforts and engage you in global movements. Below, for examples, are two Burma advocacy groups in Seattle. Further below, for those living in the U.S., is a link to a directory of refugee coordinators for every state. They often host regular stakeholder meetings. Partner, Globally. 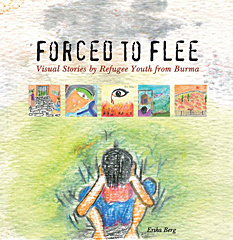 Concerned about specific issues illustrated by visual stories in Forced to Flee? Identify organizations or advocacy groups focused on those issues. If you support their approach, sign up for their e-news. Publicize their efforts. Ask how you can help. Become a valued ally. Below are a few possibilities. Engage Legislators. New to the democratic process, refugees can be reluctant to contact their legislators. Offer to schedule a meeting. In my experience, legislators welcome opportunities to meet with leaders of their area’s refugee communities. Best of all, refugees discover just how powerful their voices can be, especially when united. Honor World Refugee Day. Draft World Refugee Day (June 20) proclamations for your representatives to sign and publicize. Promote a paradigm shift in public perceptions of refugees from dependents of the state to “ambassadors” to developing countries who embody resilience, courage and resourcefulness. Participate in Cultural Events. Ask a local refugee resettlement agency how to be automatically alerted to refugee community cultural events in your area. Open-hearted members of the general public are always welcome. Share your experiences with friends, encourage them to join you.